40% of your consumers will leave your landing page if it takes more than 3 seconds to load, and around 61% of these consumers are not likely to return after having trouble accessing your landing page. The higher the load time, quicker is the user to leave the page. Considering all these factors of landing page builder, in October 2015, Google publicly introduced the concept of AMP (Accelerated Mobile pages). It introduced the new era of fast building web pages with AMP Landing Pages. Since then it is one of the trending topics, and until now, there are around 4 million AMP pages published. Now with screen space shrinking with the extreme mobile usage, the user experience is even more essential. What Is Aritic Pinpoint Doing To Solve This Problem? We have AMP landing page builder so that marketers can build personalized AMP landing pages for their campaigns. It incorporates the latest optimization features for the landing pages. This helps our users to provide the best post-click experience, which is much more essential than just mobile responsive pages. Why Are We Paying So Much Attention To It? When we analyze the current trends, we realized that mobile devices had surpassed the usage of the desktop. Even a millisecond matters in increasing the bounce rate. This trend of lower conversion rate must be steady. Marketers need to work it through for its recovery. Faster page load is one of the most important ways to help you to provide an optimized user experience and convert more leads. It is quite clear from the statistical data that around 51.7 landing pages traffic originates from mobile devices. AMP can help you to optimize the load time, landing page design and hence slash down the bounce rate. We all have clicked an AMP page occasionally but have not realized it. You might have observed that sometimes when you click on a link or a landing page website it instantly opens a full web page without any loading time. Now, those are AMP built web pages. They are distinguished by a lightning bolt indicator beside them in search results. For instance, below is a search result against keyword GDPR. There are few search results on landing page design template that have a thunderbolt like a symbol, indicating that these are AMP enabled. 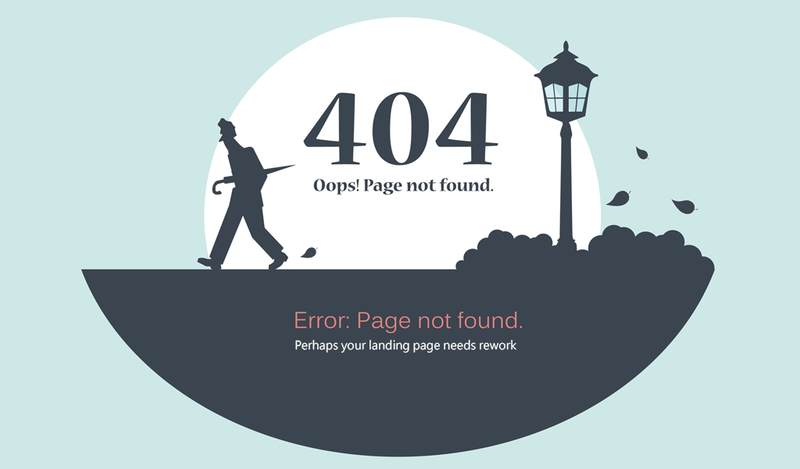 These landing pages take a lot less time to load than others. You might have never noticed this small icon but its there. Once Aritic Pinpoint enables this functionality, advertisers and marketers will be able to provide an excellent mobile experience with lesser load times. It will further help you to enhance user engagement. Thus bringing in more conversion and traffic to the website. With AMP framework, on our landing page builder, marketers will be able to deliver personalized content to their users with effective landing page design template also. Why Do You Need AMP Landing Pages? I have listed the importance of AMP landing pages and how it affects your business. 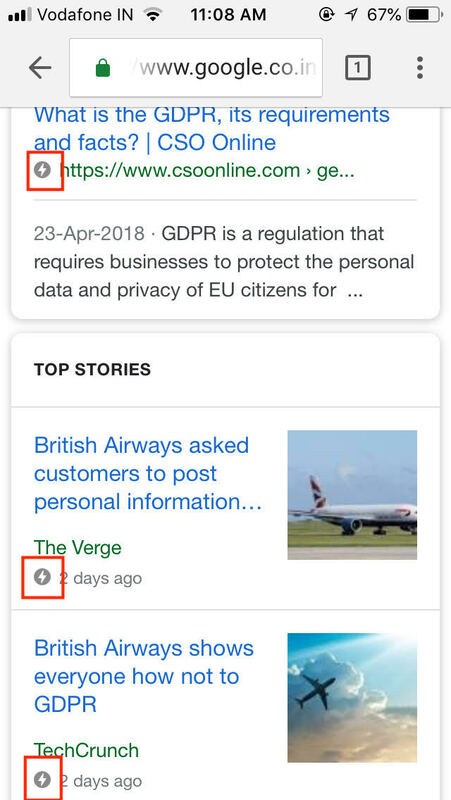 A standard mobile website takes 19 seconds to load on a 3G connection while an AMP site loads in just 10 seconds. Every second count in conversion rate and the estimates indicate that conversion fall by 20% for every extra second the site takes to load. 40% of the customers tend to leave the landing page website if it takes more than 4 seconds to load. If your mobile site is too slow to load, then the probability of the visitor revisiting your website is weak. 61% of users would not return to a website if they had a bad experience with it. Publishers have embraced AMP landing pages with open arms to accelerate their web content delivery on mobile sites. However, marketers are still lagging behind. Marketers need to understand that more users and buyers spend time on their mobile devices. Therefore, they will have to come up with mobile-optimized solutions for a successful business. AMP landing pages are useful for the users as well as the marketers identically. Advertisers: An advertiser needs to take care of the slightest details to enhance the conversion. With AMP they get to have an impressive user-friendly interface, fast scrolling, and customized styling and branding options. All these together help to improve the conversion. Users: The users get the website loaded much quicker and can access the content in just a few seconds. An excellent post-click experience when the user clicks on an ad should be the foremost priority of all the advertisers and the marketers. It helps you to maximize your sales. If you don’t plan to incorporate it, then you will make your conversion rate to suffer because of poor landing page design template. So, do not forget that AMP will always be a crucial part of your mobile-only future and your landing pages need to stay ahead of it. Connect with Aritic PinPoint team to create the most impressive AMP landing pages. The AMP features are helpful for the brands to enhance the engagement period. Thanks a lot for updating it. Great work, Jnana, it is the most important element to enhance the engagement level. Cheers! Well-written Jnana, this AMP feature is the most vital element to enhance engagement. Thanks! Thanks, Jnana for updating the AMP feature which is essential for brands to increase engagement time span. Ah! finally the AMP feature. Cheers Jnana for talking about this. There’s so much evolving in the marketing domain. This AMP feature is so minute to look at but is essential for brands to increase engagement time span. Kudos to Aritic team. I was suggested by someone about your product. So I decided to check it out which is how I landed on these blogs and read a couple of articles. I must admit Jnana that I am keen to try it out. Hope to have a good experience.